A new and fun way of eating fruits. No spoon, no knife, no mess! I was grocery shopping a couple of days ago, and this thing called Buddy Fruits caught my eye in the produce department. I picked it up and looked at it, and couldn’t quite figure it out, but it seemed to have potential. I imagined using it on toast or on oatmeal. Yeah, I could try this. Plus, it was only a dollar. I bought the apple/banana product. How could I go wrong? 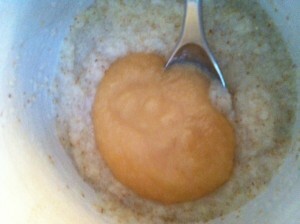 I was anxious to try my new purchase on my cream of wheat the next morning, so I opened it and gave it a squirt. 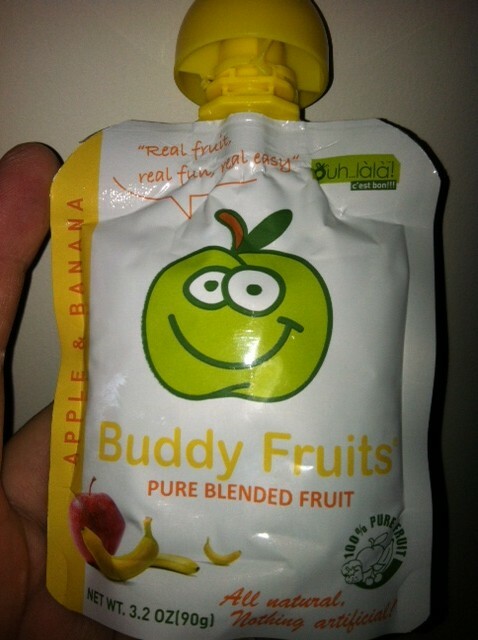 My first impression was that it had the consistency of baby food. Or apple sauce that’s too saucy. I mixed it in with the cream of wheat and tasted it. It definitely tastes like apple sauce. I wasn’t as thrilled as I thought I’d be. I was imagining something like Polaner All Fruit, but in a container that looks like astronaut food. It doesn’t need to be refrigerated until it’s been opened. After that, you can keep it in the fridge for up to 24 hours. I’ve had mine in there for days, since I’ve only been squirting out a tablespoon or so onto my cereal. Most of the fruit I eat doesn’t require a spoon or a knife. I’m sticking to apples and bananas in their original forms.